AT&T is offering a new service that allows parents--or potentially jealous spouses/boyfriends/girlfriends--to track loved ones using their phones. 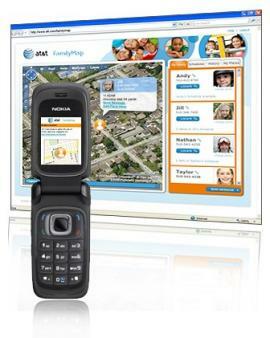 AT&T's service, called FamilyMaps, allows people to track the location of any cell phone on AT&T's network from a mobile phone or PC. The person being tracked receives a text message informing him or her that he or she is being watched. The service periodically informs the tracked individual that he or she is being watched, just in case one text message reminder wasn't enough. Users can either track someone in real time by viewing the location on a map or they can set up the service to send them text message alerts or e-mails with location information. For example, a parent may get an alert each day that his child made it home from school. Or perhaps a jealous girlfriend looking to keep tabs on her boyfriend could set up the service to notify her if her boyfriend happens to wander into a bar or over to his ex-girlfriend's apartment after work. The service uses satellite GPS technology and cell tower triangulation to pin-point the location of the phone. The service is not supported on prepaid or AT&T Go Phones. And the service costs $9.99 for two phones and $14.99 for up to five phones. Location-based services are nothing new. They've been around for years and are expected to generate a lot of money for carriers in the future. Already, most major mobile operators are offering some kind of location-based service, such as GPS-enabled navigation or tracking. Verizon Wireless, Sprint Nextel, and Alltel have each been offering "tracking" services for more than a year. Sprint Nextel has even lowered the price of its service from about $10 a month to $5 a month. The social-networking company Loopt also offers a "friend finding" application that can be downloaded on certain phones. Loopt is offered as a free application on Apple's iPhone, which operates over AT&T's network. It's also offered on some Verizon and Sprint Nextel phones. There are several other social-networking services that use location information to track or find friends or share information via a cell phone. Google also offers a tracking/friend finding application it calls Latitude. There are also other services, such as FourSquare, Whrrl, and Brightkite. What's different about these social-networking location services from the service AT&T is offering is that these other services often require those being "tracked" to also run the application on their phones. These services also typically have privacy settings controlled by the person being tracked that allows him or her to turn off their "friend-finding beacon" and to hide from certain individuals. A device called Somniloquy processes network traffic autonomously, allowing a computer's CPU, hard disk, and display to be powered down. While working on a story about routing internet data based on electricity price fluctuations, I came across a clever idea for reducing the amount of power used by ordinary computers. Researchers at Microsoft and UCSD created a network adapter dubbed Somniloquy (meaning to talk in one's sleep) that can process network traffic autonomously, allowing a computer's CPU, hard disk, display, and I/O buses to be powered down without losing connectivity. The Microsoft-UCSD network interface (described in this paper) could take over many network-related tasks like bit torrent file-sharing, and managing a remote desktop connection and a VOIP account, allowing the connected machine to enter "sleep" mode without losing its network link. The adapter consists of a gumstix module with a 200 MHz XScale processor, 64 MB of RAM and 2GB SD memory card running embedded Linux. When the adapter detects that the connected machine has entered sleep mode, it copies over networking information and carries out simple communications on its behalf. 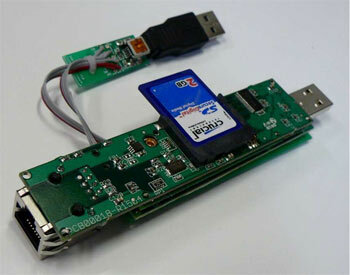 The researchers also show that the adapter can perform more complex tasks on behalf of its host. They created a modified IM client capable of responding to network messages and waking the host computer when a proper message is received; they also developed a compact bit torrent client that continues to download a file while the host is in low-power mode. It's a smart idea and I wouldn't be surprised to see such features in future desktop and laptop computers, especially as energy use becomes an increasing concern. The Palais de Tokyo's ongoing exhibition, Spy Numbers, takes as its starting point the mysterious and vaguely distressing Numbers Stations. These shortwave radio stations have been broadcasting for several decades, yet their precise function and origin are an enigma. Artificially generated voices are reading streams of numbers, words, letters, tunes or Morse code. Are they sending messages to secret agents? To governments? To weapon or drug traffickers? 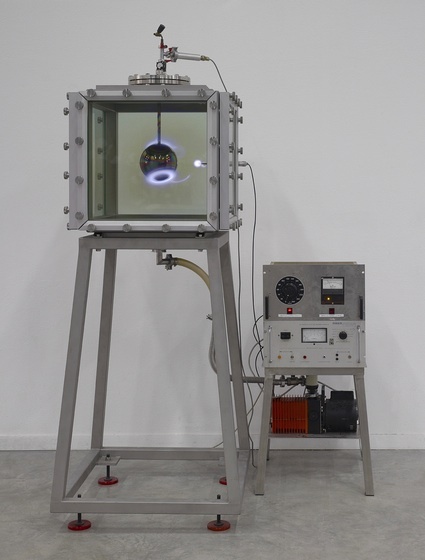 Spy Numbers echoes GAKONA, the previous exhibit inspired by the work of Nikola Tesla, in its exploration of the electromagnetic spectrum and its margins. Extending beyond the phenomenon of number stations, the exhibition explores the themes of intrigue and conspiracy. It's a small exhibition. Just a dozen pieces. Some if them very good. Pascal Broccolichi used a program to capture the electromagnetic activity taking place inside and around the Palais de Tokyo. Sonotubes, an apparatus one would expect to see on the set of 2001: A Space Odyssey, broadcasts the reverberations of these flows of buried waves. 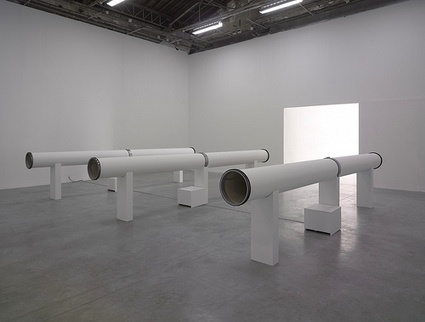 Installed at the entrance of the exhibition, Sonotubes sets the tone of the exhibition. We are in for an unsettling and mystifying ride. I saw the exhibition almost a month ago and the image that haunts my memory is the one of an invisible man. For the series Erased Lynching, Ken Gonzales-Day erased all traces of lynching from postcards and old photos. The lifeless bodies, the ropes have disappeared, leaving only the setting, the onlookers, the executioners. 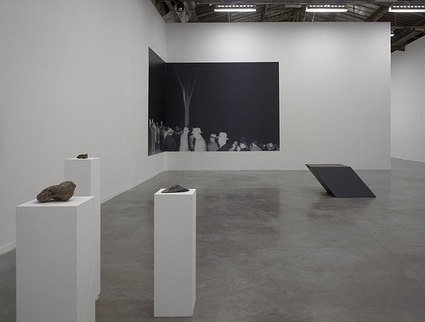 The images deliberately ignore the victims to highlight the true mechanisms of lynching: the crowd gathered to watch the show, the photographer who immortalizes these executions. Invisible, the victims are more omnipresent than ever. As the artists writes: The Erased Lynching series sought to reveal that racially motivated lynching and vigilantism was a more widespread practice in the American West than was believed, and that in California, the majority of Lynchings were perpetrated against Latinos, Native Americans, and Asian Americans; and that more Latinos were lynched in California than were persons of any other race or ethnicity. La Terrella by Dove Allouche & Evariste Richer follows the steps of Kristian Birkeland. 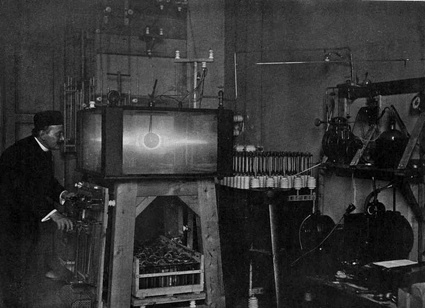 Around 1895, the Norwegian scientist tried to simulate and understand the phenomenon of aurora borealis with a Terrella, a sphere in a vacuum tank to which he directed beams of cathode rays. Birkeland found they were transformed into rings of light at the magnetic poles of a sphere, Birkeland deduced that this was the origin of the aurora borealis. Allouche and Richer produced a replica of the Terrella, which had since been abandoned, with the help of laboratories and scientists, the two artists embarked on producing a replica. For the Paris exhibition the artists made it operate in accordance with the calendar of the aurora borealis in the year when Birkeland presented his invention to the public. The piece that alludes most directly to the numbers station is a 5 meter high Numbers Station Beacon / Community Broadcast Tower that broadcasts in the exhibition space recordings of enigmatic voices reading out numbers. The mystery surrounding the meaning of the information relayed engenders anxiety. 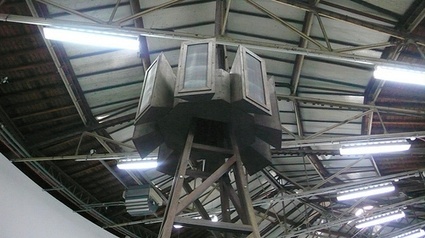 Besides, the form of the sculpture evokes other towers: powerful lighting devices, big sound broadcasting systems, transmitting antennas, or indeed watch towers. Spy Numbers opens until August 30th, 2009 at the Palais de Tokyo in Paris.